The Mason City Family YMCA strives to transform our facility from just "the Y" to "My Y" -- a place for you and your loved ones to belong. 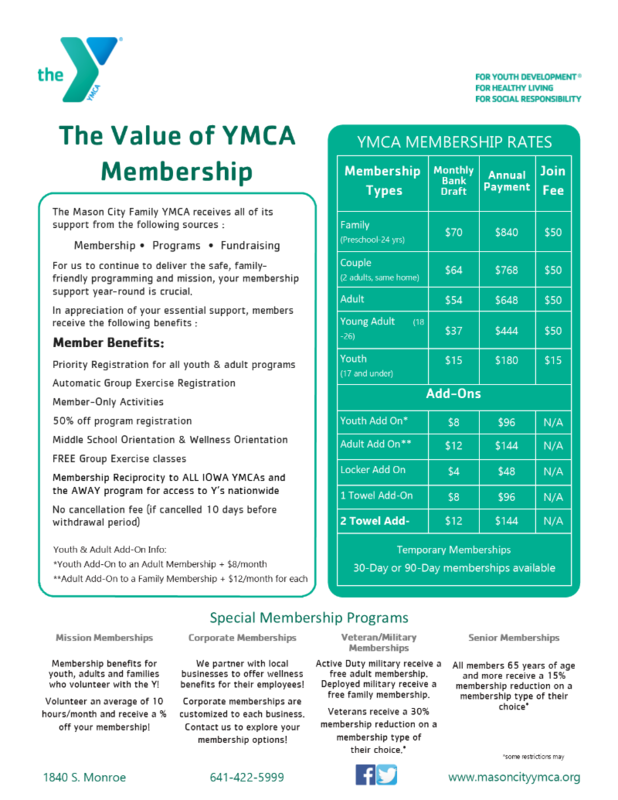 Your membership includes full access to the Mason City Family YMCA, free adult fitness classes, volunteer opportunities, reduced program fees, a chance to connect to a cause shared by more than 4,000 fellow members and more. Customize your memberships by adding towel service, lockers, child care – simply decide what is right for you! Check out our membership options below, or download the flyer below. You can make it "My Y" and experience the difference of joining a cause-driven community center, not just a gym. Members may choose to purchase their membership by paying once annually or paying each month. Pay the annual payment and experience the benefits of membership for 12 months! Annual memberships also help maintain the Y’s sustainability. We send you a letter when it’s time to renew—it’s that easy! Most of our members choose to pay for their membership via a convenient monthly bank draft (otherwise known as EFT). Simply bring along a cancelled check from your account when you join and we’ll set it up for you. Or you can pay your membership monthly by submitting information for an approved debit or credit card. Before you join, you may also want to check to see if your company is part of our Corporate Wellness program. Many employers in the Mason City area have offered their employees incentives for joining the Y – your company may be one of them! Ask about benefits for Chamber members too! NOT YET SURE ABOUT MEMBERSHIP? JOIN US FOR THE DAY! Experience the fun, energy and endless possibilities of a day at the Y! You can always come in to the Y and purchase a Day Pass at the front desk -- valid for the entire day of fun! Day Passes are available for Adults, Youth and Families. All adults must show an ID when purchasing a Day Pass. The ultimate flexible membership option -- a bundle of 10 Day Passes! These passes never expire. Get yours today!